It came to Leonardo's attention that people of accomplishment rarely sat back and let things happen to them. Here are over fifty-five sayings. Most of them are quotations of Leonardo da Vinci (1452-1519), some are abstracts, some are paraphrases, and then some more sayings are added for the fun of it. The type of rendition is shown too. Where nothing is added, Leonardo is the purported author. The quotations are largely from the English Leonardo translation by Jean Paul Richter of 1888. However, some sayings are unsourced. 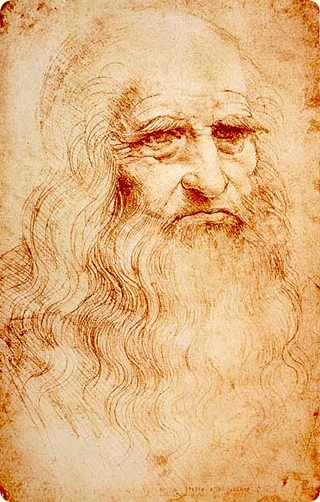 Leonardo was an Italian Renaissance painter, sculptor, architect, musician, scientist, mathematician, engineer, inventor, anatomist, geologist, cartographer, botanist, and writer. Renowned most of all as a painter, he is increasingly admired for his technological ingenuity and findings also. Man's external form, marvellously constructed, is not much as compared with the divine soul that dwells inside that structure. - Leonardo da Vinci, abr. I will rather praise a good disposition without culture, than good and stiff culture without such a disposition. - Leonardo da Vinci, mod. da Vinci, Leonardo. The Notebooks of Leonardo Da Vinci, Complete. Vol 1. (Originally published as The Literary Works of Leonardo da Vinci). Tr. Jean Paul Richter (1883). Gutenberg edition (Urbana IL: 2004) online. da Vinci, Leonardo. The Notebooks of Leonardo Da Vinci, Complete. Vol 2. Tr. Jean Paul Richter (1883). Gutenberg edition (Urbana IL: 2004) is online.